London, Ontario – A newly available soil health test not only tells farmers the state of their soil, it also provides recommendations on what can be done to improve it. And it’s the first soil health test that makes a direct connection between healthy soils and higher yields, providing the potential for better farm profitability. 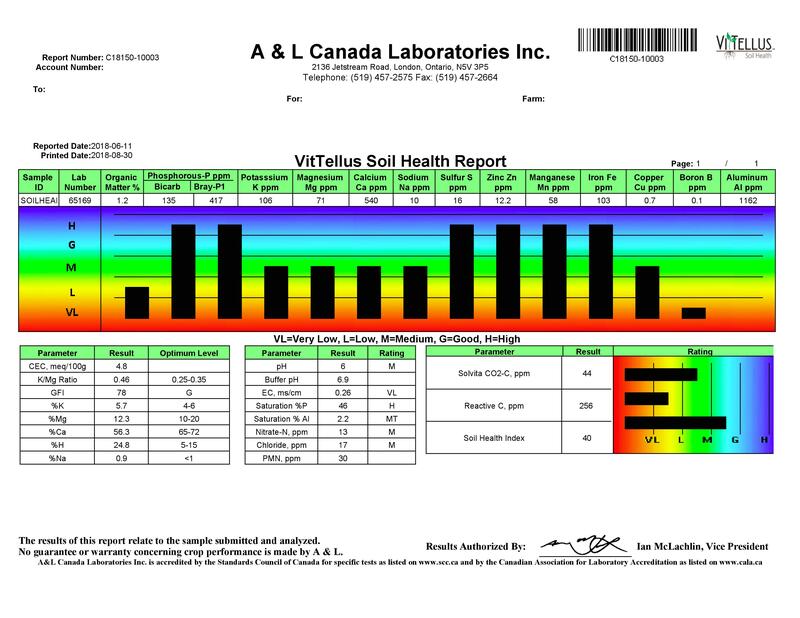 A&L Canada Laboratories’ VitTellusSM soil health test is the result of eight years of extensive field research by the London, Ontario-based company’s research team. In conjunction with 50 farms they assessed over 400 factors related to soil health and yield and studied the complex relationship between plants and soil microbes. Their research was published in the Journal of Microbiology and Experimentation in 2017. According to Saldias, the microbe population in a highly-producing field is significantly different than in a low-yielding field. A higher index on the 0 to 60 VitTellusSM scale means there is more microbial-plant balance in the soil, resulting in better nutrient uptake and higher yields. A&L’s research has confirmed a 93% correlation between actual yields and those predicted by VitTellusSM. In addition to the soil health index, the VitTellusSM Soil Health Test also includes Solvita CO2, potential mineralizable nitrogen, reactive carbon and standard fertility results. These are accompanied by crop production recommendations specific to the tested fields, as well as online portal access to reports and live customer support from the A&L agronomy team. “Our system is unique because we don’t just give you results, we also interpret them for you and make suggestions for continuous improvement,” says Saldias. Norfolk County cash cropper Dan Petker first learned about VitTellusSM when he took some A&L soil fertility classes last year and is pleased with what he’s learned from trying it on his farm. A regular soil test is an excellent way for farmers to start learning about their soils and ensuring their fertilizer investment follows good stewardship principles as you would find in the 4R Nutrient Stewardship Program, suggests Saldias. VitTellusSM provides the next step of deeper understanding and connecting soil health and quality to yield and economic benefit to the farm business. For more information, visit www.VitTellus.com. A next generation Soil Health Test providing actionable strategies for improved nutrient utilization and higher yields. Traditional soil tests measure the chemical properties of soil, and that is helpful. But soil is a living, dynamic and continually changing ecosystem requiring a more holistic approach to determining optimal and sustainable management practices. By digging deeper into the physical & biological interactions we can make improved agronomic recommendations for higher yields and great profit. The A & L research agronomy team has developed and launched VitTellussm Soil Health, next generation Soil Health Test and recommendation package to help farmers and crop consultants make more informed decisions on application of nutrients, and managing and improving their soil. 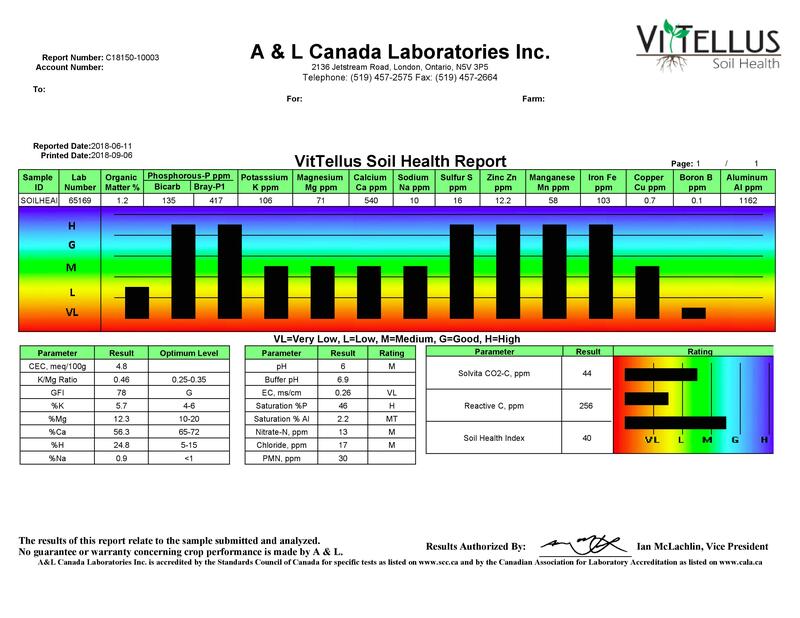 The VitTellus Soil Health test is available worldwide and can be accessed through the VitTellus website. “Unravelling the complexity of soil science for agriculture leads to more productive approaches and result in healthier soil, stronger plants and greater returns for the farmer and society. This is a worthwhile, long view endeavor, we strongly encourage farmers to truly get to know their soils for their longstanding success,” said Greg Patterson, C.C.A., Founder and CEO of A & L. “We are proud of all the research and development work coming out A & L Labs and are committed and passionate about sharing our knowledge for the advancement of the industry. Click here to submit an order for a VitTellus Soil Health Test. Additional soil health tests are available. For more information please visit our website www.vittellus.com or call us toll free at 1-855-837-8347. You can follow us on Twitter at @VitTellus. We are an innovative, research driven technology company focused on sustainable development. Through leading expertise, modern laboratory facilities and strong customer focus, A & L serves a wide range of industries including Agriculture, Environmental, Food & Pharma -- globally. In Agriculture, A & L provides comprehensive analytical services for soil, plant tissue, feed, fertilizer, and water. A & L’s services also include production recommendations, remote sensing and precision agriculture capabilities. A & L Biologicals Inc. is a subsidiary of A & L Canada Laboratories Inc. focused on research and development of biological compounds for use in agricultural production systems. The Environmental division provides organic and inorganic chemistry and general chemistry using state of the art technology and methodology. For Food & Pharma, A & L provides analytical services for plant tissue, water, media and finished product. A & L’s services also include disease diagnostics, genetic analysis, production recommendations, and Plant Monitoring Program. The company operates two analytical laboratories serving clients throughout Canada, the US and Internationally.